1. Whip the cream to soft peaks; set aside. 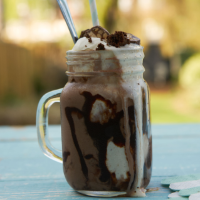 Drizzle some chocolate sauce in messy lines on the inside of a sundae glass or jam jar. Whizz the vodka and chocolate ice cream in a blender until completely smooth. 2. Pour the ice cream mixture into the glass, then top with the vanilla ice cream, then the whipped cream. Garnish with chunks of chocolate brownie, Snickers and any other extras you fancy. Serve immediately with a straw and a spoon. This recipe was first published in Thu Jun 01 14:47:00 BST 2017.